Home > Vitamins & Food > Are Vitamin Enriched Sweets and Snacks Worth the Money? Increasing numbers of manufacturers are adding vitamin to snack foods, including savoury snacks and sweets (as well as drinks - see also ‘Are Vitamin Enriched Soft Drinks Worth the Money?’).’Do these added vitamins really turn junk food into something that is healthier? People who do not eat a balanced diet do not always get enough vitamins, so it could be argued that if they are going to eat sweets and snacks anyway, they might as well eat ones that are fortified with vitamins. As a general rule, it’s better not to eat too many sweets and unhealthy snacks and fill up on fruit, vegetables and low-fat dairy products instead. Rather than reaching for a healthy snack like a piece of fruit, some people may be tempted to eat a vitamin-enriched sweet or snack because they may think that it is just as good for them. They may also be lulled into a false sense of security about their overall vitamin levels. Vitamin enriched sweets are still high in sugar, and vitamin enriched snacks are likely to be high in fat and salt. The levels of added vitamins may not be high enough to make a difference to anyone’s diet. 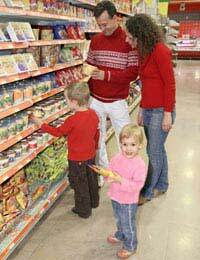 Vitamin-enriched sweets and snacks are also likely to be more expensive than the non-enriched versions. People who eat a balanced diet, take a multivitamin supplement, and eat vitamin-enriched snacks may run the risk of taking in too many vitamins, which can cause stomach upsets and may cause long term damage. Check the label for the levels of sugar, salt and fat – treats like crisps and sweets are fine, but they should just be treats, rather than something that is eaten regularly. Check how high the levels of added vitamins actually are – if getting enough vitamins means eating an entire packet of sweets, then the damage to the waistline may outweigh the benefit of the vitamins! Apart from some people with certain disorders, or who eat a very restricted diet for medical, ethical or religious reasons, eating a varied and balanced diet with plenty of fruit and vegetables should provide all the vitamins (and minerals) needed. To get some extras, and for a healthy snack, fruit always makes a good choice, full of a range of vitamins (as well as being part of the recommended five pieces of fruit and vegetables a day). For high-vitamin snacks on the go (that are also part of the five a day), make up portions of dried fruit (preferably not sugarcoated) in small bags. Nuts and seeds are tasty and high in fibre, vitamin A and E and minerals. Cheese is high in vitamin D, and also provides calcium (and 15 minutes in the sun a couple of times a week will also provide useful levels of vitamin D). Watch out for portion sizes of cheese, nuts and seeds, as these can be quite high in calories.